I returned home yesterday bone tired and breathless, after 3 action packed healthcare advocacy days. The 3 days culminated with the MQC annual conference. The meeting started with a lovely opening by my friends and esteemed colleagues Dan L’Hereaux, Chairman of the MQC board of directors, and Dr Lisa Letourneau, MQC Director. Then a brand new patient advocate Loren Arford spoke from his heart about his experience as a member of his doctors Patient and Family Advisory Council. After our State Commissioner of Health, Mary Mayhew spoke, we all got a slap down by Dr Doug Eby, from South Central Foundation, a population owned healthcare service in Anchorage AK. WOW, I loved that guy. I sat at a table with my husband, my niece Angela McCleary, Rosemary Gibson, Daniella Nunez from the Consumer Union Safe Patient Project, Poppy Arford and her husband Loren, and we all agreed, Dr Eby speaks OUR Language. It was soooo nice to take our wading boots off and listen intently to this man’s message. With his brilliance, he cuts through the BS in healthcare, and because of that, and his willingness to partner with his patient/owners (most importantly), and his staff, his practice has immensely improved the health and reduced ER visits of the native population he serves. He isn’t that overly impressed with his work because he knows it isn’t 100%. He settles for nothing less. Oh yes…this guy is getting it done. Bring it on Dr Eby! As always, there are so many things to see and do, and so little time. I’m thinking that maybe our next conference should go for an extra day, and then we would all have the opportunity to go to every single break out session. Making choices is always hard. I attended the Choosing Wisely session first. I must say, Dr Santa earned his keep in Maine this past few days. He shared his wisdom with us 4 times in 2 days, and I am so grateful for that and for him. Choosing Wisely is an incredibly transformative campaign. Next, I introduced my friend and mentor Rosemary Gibson. She joined with Karen Heck, Mayor of Waterville, and David White, small business owner, to have a conversation about how ever increasing healthcare costs are affecting our communities and businesses. Her soft spoken wisdom blows me away every single time. After I stumbled on my introduction of Karen (saying “tea tree” instead of Tree Spirits LLC/ the name of her small business), Rosemary carried us off into this deep and often disturbing discussion. She speaks the truth, and the truth is hard to hear. Oh my, our communities and our small businesses are suffering, and a big part of that is because of healthcare benefits and services costs. There is an undeniable connection. Something’s got to give. I was in line getting my lunch and having an incredible conversation with my friend Susan Schow, when I heard the announcement that the awards were beginning. OH NO…I asked to skip in line because there were a LOT of people there. 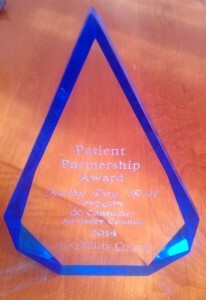 My dear friends Dan L’Hereaux and Poppy Arford presented me with the Patient Partnership Award yesterday. Time to get the Kleenex out. It’s hard for me to put into words how this affected me. 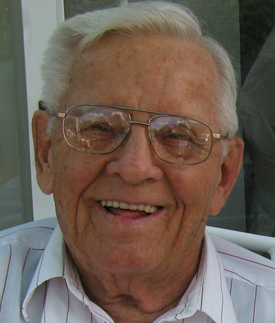 The reason I am doing all that I do, is because of my Dad. His preventable infection and his poor healthcare outcome catapulted me into this fray. There is no doubt he was with me yesterday. It still makes me incredibly sad to think about this, but from bad comes good. After Dad’s infection I wanted improvement. I still do. I have come to realize that the work is never ending and that the goals need to be (ala Dr Eby) 100% or excellence, and nothing mediocre. No compromises. So, my greatest award in this work is that gradually, patients are safer, and fewer of them are getting infections. My next greatest award is that room full of patient safety advocates and activists. Three years ago I attended this conference alone and I sat with strangers. The only person I knew was Regina Holliday! What a difference 3 years can make. I’m amazed at who surrounds me at meetings now. I am very humbled by and grateful for my growing circle of like minded advocates and for my beautiful award. Dr Susan Burden is absolutely something else! I totally appreciated the s-t-r-e-t-c-h. It was silly, fun and much needed after lunch. She is dynamic and progressive, and I totally understand the success in her California programs. I’m not making excuses for my excess weight, but really….we are at a bit of a disadvantage with our long difficult winters. Finally, I was honored to facilitate a late afternoon break out session for 3 other consumer advisory council colleagues. Poppy Arford, Dian Boas and Kim Humphrey each made their cases for 1. healthcare costs transparency 2. pharmaceutical information transparency and 3. Organizational transparency. These three experts squeezed an amazing amount of information into 24 minutes (8 minutes each..I know because I timed them). Their messages resonated big time. The response, and questions from our audience were proof. This type of presentation is not only informative, but it is essential. Thank you to my very special friends/colleagues for sharing your knowledge and insight. Maine Quality Counts, under the leadership of Dr Lisa Letournneau, is very adept at coordinating this incredible yearly event. They are not afraid of ‘mixing it up’ and including controversial and sometimes uncomfortable messages with the good news in healthcare. That takes great skill and wisdom. The hard working staff and the awesome planning committee (I was on that!) deserves a huge applause. Can you all hear me clapping?? I’m beat…time for a nap.